After some research in Internet and after reading the book Setting-up a Small Observatory (by David Arditti) I decided that the best option for me was to build a run-off shed Observatory, mainly due to the lack of free space available in my garden. Below I have outlined the three phases of the project: 1- Creating the concrete foundations 2- Mounting the iron pier 3- Building the run-off shed. First I dug a hole 130 x 80 cm big and 40 cm deep. Then a layer of concrete 25 cm deep was poured. After about two hours, a wooden frame 60 x 50 x 15 cm was placed on top and filled with concrete. A few minutes later, four threaded rods on a 25 x 25 x 0,5 cm iron plate were inserted on the plynth (as shown below). I checked during the following hours that the plate was kept level. The cost of the foundations was about 250 € (including labour). I decided I would go for an iron pier since a concrete one is not possible to move to another place if necessary. The dimensions of the pier are: 100 cm high, 15 cm diameter and 5 mm thick cast iron. The top and bottom plates are 25 cm diameter and 12 mm thick. The threaded rods used are all 12 mm diameter. The pier was fixed to the threaded rods embedded in the concrete with two nuts each and tightened. It was then filled with sand. After that, a wooden floor was set making sure there was no physical contact between the concrete foundations and the flooring. Total cost for the pier was 150 €. This was probably the most difficult part. 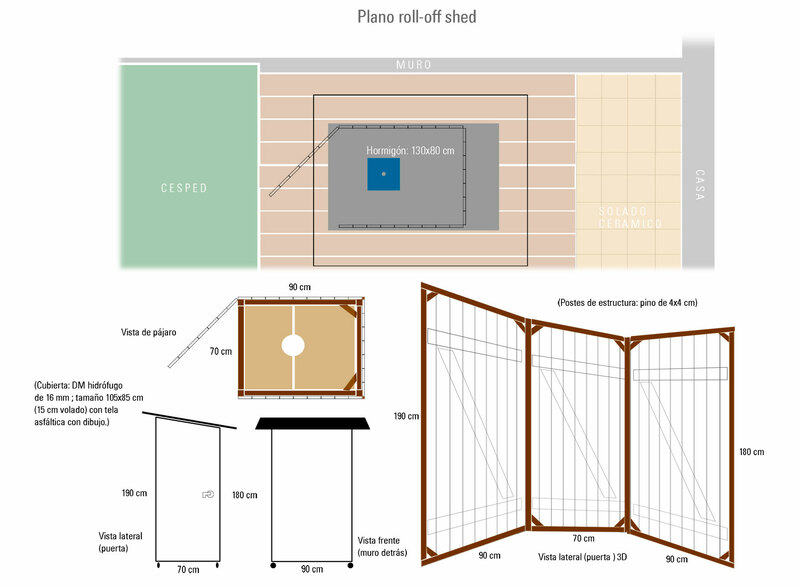 I took many measurements to find the minimum optimal size for the shed and then drew a plan and chose the materials I would use. All sizes are specified in the plan. I then hired two carpenters who did an excellent job in building the shed. It took them about five hours in total. Total cost of the shed was 550 € (of which 250 € was labour cost). Click on the plan for a larger view. 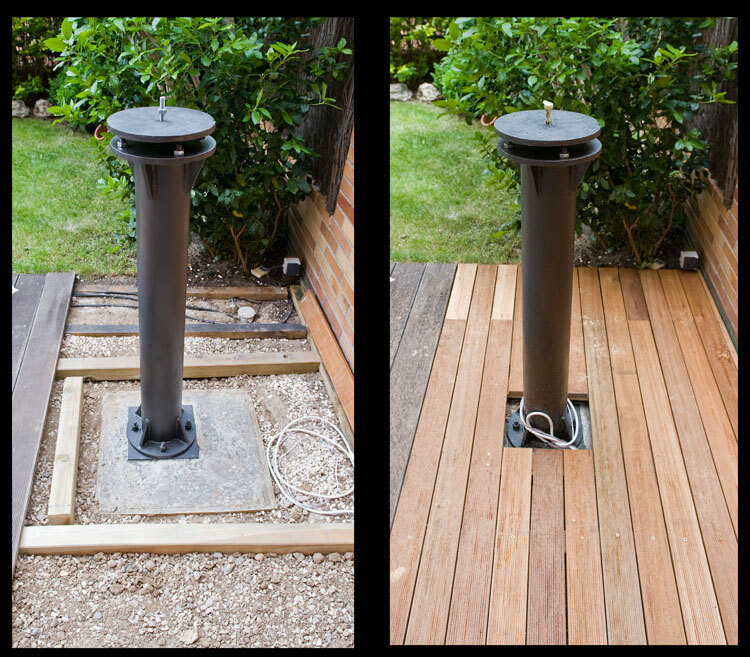 Here you can see a sequence of three pictures showing how the run-off shed works. I am basically satisfied with the run-off shed. It works well, the cost was low, and both the pier and shed are well built. The only thing I would change (for the next time!) is the SIZE of the shed: I "optimized" too much the dimensions, so my current set-up barely fits in, which means that a slightly larger telescope and/or mount wont't fit in!